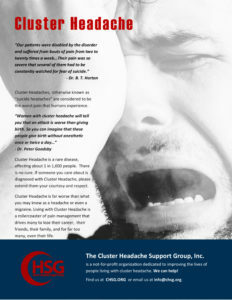 Triptans are effective for immediate relief of episodic cluster headache (CH) but do not reduce the frequency of attacks. Intravenous bolus injection of corticosteroids like methylprednisolone (MP) has been reported to decrease the frequency of CH attacks. We validated the prophylactic efficacy of MP pulse therapy by monitoring CH recurrence over several years following treatment of six consecutive male patients (mean age: 38.8 years, range: 26–54 years) afflicted by frequent (often daily) CH attacks. Migraine is a primary brain disorder resulting from altered modulation of normal sensory stimuli and trigeminal nerve dysfunction. The second edition of the International Classification of Headache Disorders (ICHD-2) defines seven subtypes of migraine. Migraine treatment can be acute or preventive. New targeted therapies include 5-HT1F receptor agonists, calcitonin gene-related peptide (CGRP) antagonists, nitric oxide synthetase inhibitors, and ion channel antagonists. A recent development is the creation of antibodies to CGRP and its receptor for migraine prevention.